Hot Pool Hideaway Views is an elegant property, completely renovated with spacious living for 2-6 people and an indoor hot pool. This recently posted review sums up our property beautifully. We’ve loved our stay in Taupo, and the house was a fantastic place to spend a couple of days. Stunning views, very modern and comfortable, lovely en-suite bathroom and kitchen was well equipped. Highly recommend!!! 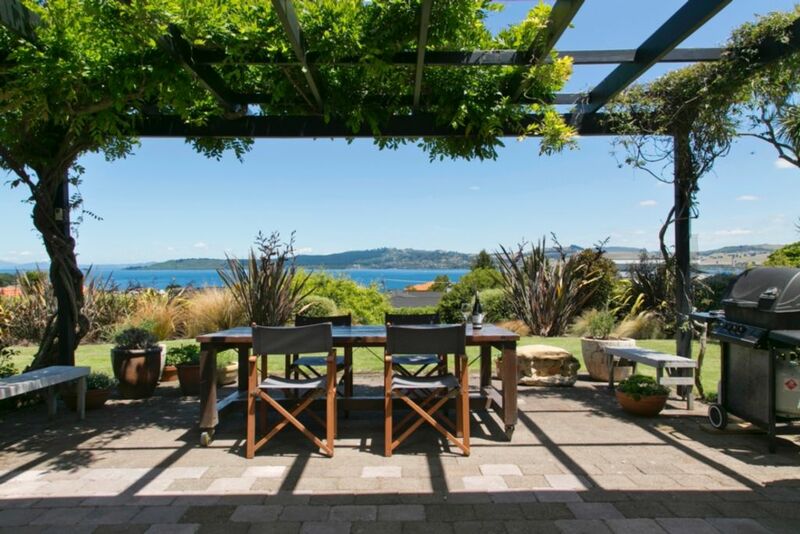 It has a beautiful view of the lake stretching from the Mountains, (Ruapehu, Tongariro and Ngaruahoe) to the township of Taupo and a modern internal, thermal hot pool which is rare in Taupo and a real luxury. This sunny, beautifully decorated house is down a right of way leading to a large private garden on two levels. The master bedroom, with walk-in wardrobe, computer desk and ensuite has large doors opening out to the garden and lake view. The second bedroom has lake views, garden view, a window seat, wardrobe and chest of drawers. The third bedroom has two single beds, wardrobe and chest of drawers. The house is warm, fully furnished and has open plan style living. It is enhanced by a separate TV room or sitting space with comfortable window seat and the same beautiful lake views. There are two full bathrooms (one an ensuite) and a third bathroom with toilet and vanity. The whole house is double glazed and we have a large, Rinnai Gas Heater, which is flued to the outside, in the sitting room, and electric heating in all other rooms. There are lovely sitting out door areas both front and back of the house providing sheltered outdoor living at all times. The front courtyard has a large outdoor table with plenty of seating and a Weber Barbecue. It is a beautiful setting looking out to the lake and garden with views of Mt Ruapehu and Mt Tongariro on a clear day. The garden is well landscaped on two levels, providing great space for games and added relaxation. We are within a few minutes walking to the lake at the bottom of the street, and excellent walking, biking, running facilities right beside the lake with 'The Lions Walk' to the left, around the various picturesque bays, and all the way to the township to the right, where you can stop for coffee at Expresso Cove Cafe beside the water, or at the coffee cart or gelato cart en route! It is a few minutes drive to the very active township of Taupo with its multiple cafes, bars, restaurants and shops. Taupo has amazing activities and is the adventure capital of New Zealand. Jet boat rides on the Waikato River right up to the magnificent Huka Falls, Paragliding, Sky Diving, Bungee Jumping, world famous trout fishing, mountain biking and four golf courses. Taupo is a great lake for water-skiing, sailing, boat cruises where one can be promised fresh trout for lunch or dinner. This property is in a quiet residential area and respect for our neighbours is essential. The house is suited to families and small groups. Linen: Can be hired NZ$24 per bed or you can bring your own if convenient. We have owned this property for 17 years and have had wonderful family holidays here which we are now enjoying with our grandchildren as well. We did an extensive alteration in 2016 which has allowed for much greater comfort, warmth and size. We live between Wellington and Taupo at this stage. I have been visiting Taupo since I was a teenager, and then my family also bought a house diagonally across Shepherd Road from where we are now. This particular area is great for sun, as on a ridge, but is also on the town hot mineral belt so we can have our own mineral hot pool. Excellent, alive shopping centre with great clothes shopping, masses of cafes to choose from, restaurants, speciality shops, Art Galleries with unique New Zealand flair. Richmond Heights is our local village with hair dresser, fish and chip shop, bottle shop and good general store. We loved our stay at the hot pool hideaway! The house was lovely— nicely decorated, spotless, and comfortable. Michelle was extremely thoughtful and welcoming. Having a hot pool in the house was fabulous, especially after long hikes. The views are also stunning. Our family couldn’t have been happier with our stay. The house is perfect. Thank you very much for your lovely review, I really appreciate it. We do try to provide a high standard for our guests and the feedback encourages us to continue to do so. Beautiful property, stunning views, well equipped and very comfortable. One of the best properties in Taupo - don’t hesitate to book, I can assure you that you won’t be disappointed. Thank you so much for your fabulous review Linda, I really appreciate it. It seems you had fantastic weather over the period of your booking. We had a wonderful stay here for two nights and enjoyed every minute. The house is lovely and the outside with the view and garden was very relaxing. The location is also very good for a quick trip into town or for taking a walk to the lake. I would definitely stay here again and highly recommend. Heather has been an amazing host from booking to all the way the through.. always replied promptly to any questions we had. The house is beautiful and decorated to a very high standard but still remains very homely and comfortable.. a real home from home. The the hot pool was fantastic.. amazing to experience the thermal waters of the area within the comfort of our own accommodation. Taupo itself was a lovely town with lots on offer.. we only had two nights and wish we’d booked longer. We’d highly recommend renting Hot Pool Hideaway whilst exploring Taupo and the surrounding area. Thank you very much for your wonderful review. I am so pleased you were happy with our home and whilst I didn't meet you, I enjoyed all our communication, especially from Rotorua! I want to thank you for your fabulous review. It is very rewarding when a guest loves our house as much as we do! I do hope we see you again. Taupo is one of the best Adventure Towns in New Zealand. There is something for everyone here. Parachuting, Paragliding, Bungee Jumping, Boat Hire for relaxation and fishing, wind surfing, Geyser Parks, excellent mountain biking, walking, golfing and shopping. Taupo is a town you can be spend many days in and still not do it justice. A great town in Central New Zealand with easy access to lovely towns nearby. Napier 2 hours, Skiing on Mt Ruapehu 11/2 hours and Rotorua 1 hour.